This collection of interviews with editors started years ago as part of a PhD thesis in Publishing, from UCL’s Department of Information Studies. 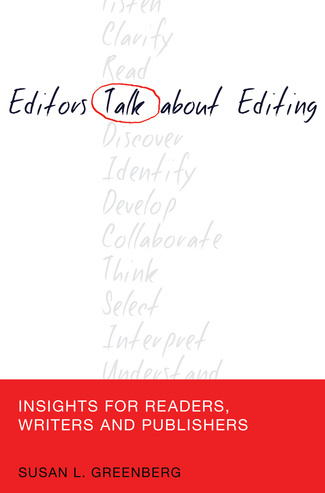 The book version provides readers with a full text of each conversation, a few working conclusions about editing, a caveat about social constructivism, and a reflection on the special character of the interview, a very performative form of research. Work on a second book drawn from the rest of the thesis – a theoretical and historical analysis of editing up to the digital present – starts in earnest this summer. Because the whole project sets out to be comparative, the book deliberately juxtaposes people in very different kinds of publishing, to acknowledge not only the familiar ways in which they are different, but also how they might be the same, and to understand recognisable patterns in their practices, values and concerns. When I approached people, it was not a sure thing that they would say yes. They are high flyers, leaders of their field; would they even want to talk? In fact, they all agreed, and after a few meetings, I realised why. They love their work, but it is a kind of work that does not often get attention in its own right. And here was someone who wanted to talk with them about just that thing. So they said yes. But it was still an enormous amount of work: to agree on terms; draw up the questions; meet and talk, both of us thinking on our feet; transcribe and edit; consult; analyse; and edit again. Look out for extracts from the book, published here over the next few weeks.